Brainerd Minnesota High School alumni. Hello! Some of you probably know me and others I know don't. 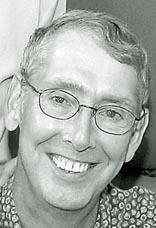 I'm Tony Gebhard and I created and maintain the class web site at this time. Carol (Drahos) Thesing has volunteered to help me maintain and keep the information as up to date as possible going forward. May 1969 the senior class of Brainerd High School said good bye to classmates and teachers leaving our mark as the first graduating class from the new high school. Teachers and parents and our community joined together to give us the best academic education possible. An education that has well equipped us with the basic 'life skills' that has enabled us to live successfully in the world today. Whether it was one year, or more this was our home, and at The Brainerd High School we made a lifetime of memories, formed eternal friendships, and learned invaluable lessons that helped to shape and mold us into who we are today. This can only be a reality with the help of all of us participating if we can. You are invited to Participate in Creating a Legacy! Progress is being made in our goal for an annual “Class of 1969” BHS scholarship for a graduating senior to attain a one-time check for $500 toward their education, post completing their first school term. The first recipient will be awarded $500 from outright donations at the May 2019 Senior Award Night. They will also be recognized personally at out 50th Class Reunion in August 2019. WHAT AN OPPORTUNITY --to meet this student! The $12,000 Goal is to guarantee that we would have $500 for a student recipient annually over the next 50 years+. Once we meet this goal no further donations are required. MATCH THIS CHALLENGE!!! An anonymous donor has come forward willing to match the next $2,000 donated by June 30, 2019. WOW!!! Let’s work to make this a reality…$945 match to date…. Donate now!! Donate a theme basket, gift certificates, sports tickets, tools, electronics, toys, your time-specialty, trips, or even cabin rental. Let’s get creative and have fun with this! Anything on which you would like to make a bid! Giving back to the community by assisting our future leaders. How can this happen? With the support of the Brainerd Public Schools Foundation (BPSF) endowment program our application to start a tax-deductible fund for a graduating senior to be first awarded in 2019 had been approved. If we can raise a minimum of $12,000 by August 2019 we can established an award of $500 to a graduating senior annually for many years. No amount is too small to work towards our goal and is greatly appreciated. This is a wonderful way to show our Warrior Spirit and a means to pay it forward. The Class of 2019 scholarship recipient will be invited to our 50th class reunion celebration on August 24, 2019. Criteria for the Scholarship: To be awarded to a graduating senior who has been in the Brainerd School System for a minimum of five years. GPA of 2.5 or better and plans to attend an accredited trade school or two-four-year college. Prefer a student who has taken the initiative in the past year to actively participate in extracurricular projects in school or in the community that benefit others. Prefer a student who has not necessarily qualified for any other monetary awards available. How to Donate: For more information and the tax-deductible donation process click here http://www.bpsf.org or visit the website. 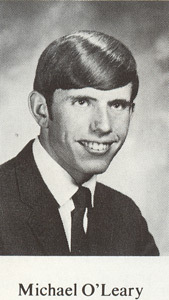 Please make reference to the Class of 1969 in the COMMENT/MEMO section for the funds to be added to our account. Donations can be a one-time contribution or monthly etc. You can also use the form attached. Thanks so much for making a difference. Testimonial from a Student: There are many reasons why this scholarship has helped me and benefited my education. It has motivated me to take extra classes, allowing me to finish my AA degree just one year after I graduated high school. It also encouraged me to continue my education and pursue a bachelor's degree at University of Minnesota Duluth. Having this scholarship allowed me to explore a variety of classes and decide on a major field of study before transferring to a four-year college. Thank you for your time and consideration from the “Class of 1969 Scholarship Committee”: Susan Koering, Sue (Kost) Mortenson, Jan (Lyscio) Hall, Tony Gebhard, and Kevin Hall. Can you hardly believe it has been 50 years since we were the first graduating class of the newly built Brainerd High School? Do you remember our first days of classes? Construction was not completely finished. We spent some time sitting on the floor because all the furniture required for operation had not yet arrived. The student common lounge area had no furniture. Our class contributed to buy furniture for the space because it was not considered appropriate for the school district to purchase such a luxury, furniture, for a student’s lounge!!! Do you ever wonder what happened to certain classmates? Are your grade school friends still around? Will they be there? Are you ready to take advantage of this once in a lifetime opportunity to reconnect with old friends to relive the joys and tribulations of our times together? 1. 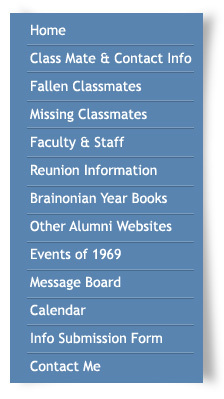 First please, please, please go to our on line year book; http://www.brainerdhighclassof1969.com/info_submission_form.php and fill in the form to update your personal information and tell us about you!! Remember, a lot can be said in a few sentences. it will mean a lot to hear from you!!! Also, spend a couple of minutes to go thru our yearbook and the updated information of other classmates. 2. The committee is working to make sure this reunion is exciting, fun, and interesting. We want this reunion to be comfortable for everyone. 3. To help us coordinate the event the committee has set the deadline for the re-union registration for August 1st, 2019. You can register now which is greatly appreciated. 5. 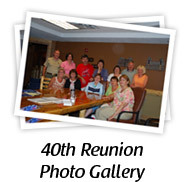 Let us know what activities you would like to see happen during the reunion. Three things we have thought of are; (a.) Friday: tour of the Brainerd High School building. (b.) Saturday: Pontoon boating on Gull Lake (c.) Golfing at Cragun’s Legacy Course. Please mention your preference or other ideas on the registration form. 6. Lets all be a part of the BHS Class of ’69 scholarship fund. Meeting our $12,000 goal, will allow for our “Class of ’69 BHS Scholarship” fund to award one (1) $500 scholarship on an annual basis over the next 50 years. See the attached informational sheet from the Scholarship Committee for details. 7. Please address your comments and questions to committee members; Jan (Lyscio) Hall 218-851-0335, Colleen (Creger) Smith 218-838-4371. If anyone would like to comment on this please send me an e-mail and I will share it with the rest of the committee.